Whenever I go on a trip, I try to look up itineraries that other people have made for themselves to get an idea on how I would like to plan my trip. Some of them have been helpful (while others do not really coincide with the places I want to go to), so I thought to do the same and upload our trip’s itinerary for anyone that is curious or needs some help planning their time in Japan. To be quite honest, I did no planning whatsoever regarding the destinations and timeline for our trip; my boyfriend previously did this trip with a friend the last time he was in Japan so we delegated the planning to him. 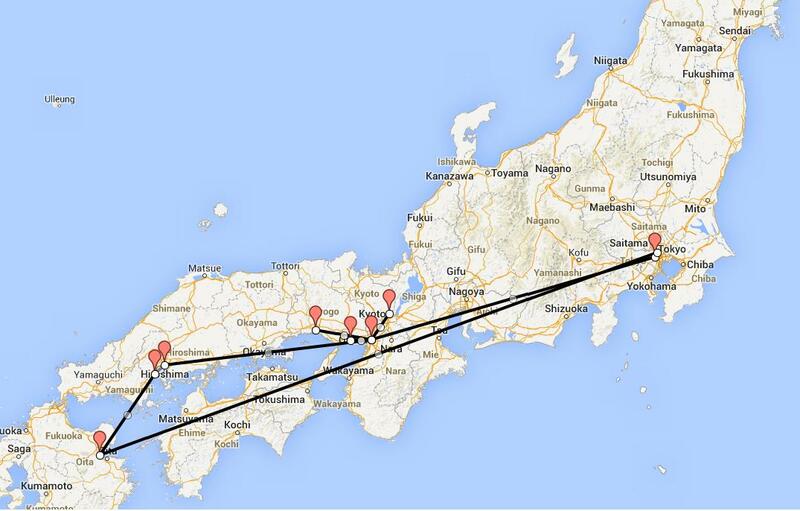 This was his 7th or 8th trip to Japan, as he previously had family living in Nagano and Nagoya. Before we left for our trip I nicknamed our trip “Operation Hello Kitty”, as I’m silly and like to label things as operations, and Hello Kitty seemed fitting. Day 2-6: Osaka with Day Trips to Kyoto, Himeji and Kobe. Day 7-8: Miyajima with a Day Trip to Hiroshima. One thing to note is that our total vacation may have been 17 days, due to travelling overseas from Canada to Japan (and back) our trip actually totals out to 16 days. Keep this in mind when you are planning and account for your travel time. Note: This detailed itinerary doesn’t include all meals, window shopping and wandering aimlessly. Though it may not seem like we did a lot, our feet would tell you otherwise. There are a lot of things that we wished that we could have seen/done that we missed. 1. You will be walking around a lot, so bring a comfortable pair of walking shoes. 2. Plan ahead of time what you want to see/do, and also come up with a back up plan(s) in case your plans that day change. Don’t plan to see too many things in one day, as you’ll be exhausted. Prioritize what you want to see/do on your trip. 3. Each site will take anywhere from 1-3 hours, depending on how thorough you want to be. For shopping and visiting districts over tourist sites, I would plan to spend more time. 4. We went from the big cities of Tokyo to the quiet little cities like Miyajima. If you are wanting to have more of a “touristy” trip, I would suggest sticking to the bigger cities; however, Miyajima and Beppu are definite places to go if you like a quieter and more relaxing time. 5. If hopping from city to city, I urge people to purchase a JR Rail Pass prior to coming to Japan. It is a definite money saver (will have a blog post dedicated to the rail and transit system soon). Also consider travel time from city to city, and plan your destinations wisely. I hope this helps out some of you if you are planning a trip to Japan. Let me know if you have any questions and I will try to answer them to the best of my ability.